An irremovable black line may appear at the bottom of a paragraph. It is probably caused by typing -------------, and it will automatically change to a border. Here's how to remove the line. This process also works in Word 2013 & 2010. Step 1:Click anywhere in the paragraph with the border. Step 2:Under the Home tab, click the Border button in the Paragraph group. 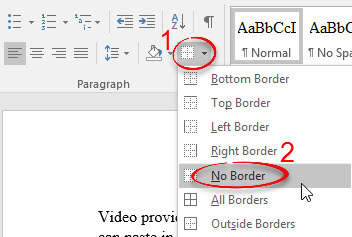 Select No Border.